What should you take to the beach? Here’s your beach vacation packing checklist! Summer is here and it’s time to hit the beach! There are many beaches to choose from in Lake Tahoe and Truckee. 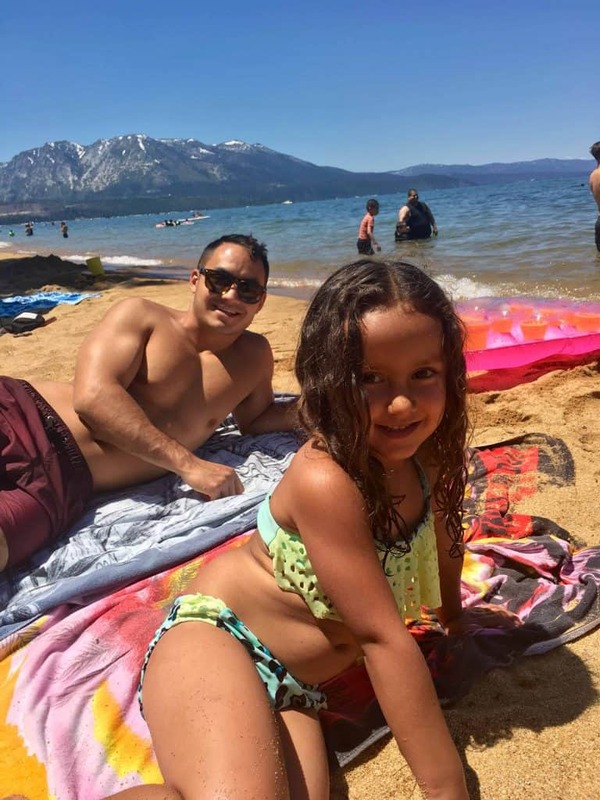 Some of my favorites on Lake Tahoe include Sand Harbor, Kings Beach State Recreation Area, and D.L. Bliss State Park and West End Beach on Donner Lake in Truckee. Did you know there are a lot of other beaches and lakes around Truckee that are easy to access, less crowded and just as refreshing? Truckee has access to numerous lakes within an easy 5-15 minute drive where you can find everything from a fun, family scene to alpine and secluded. 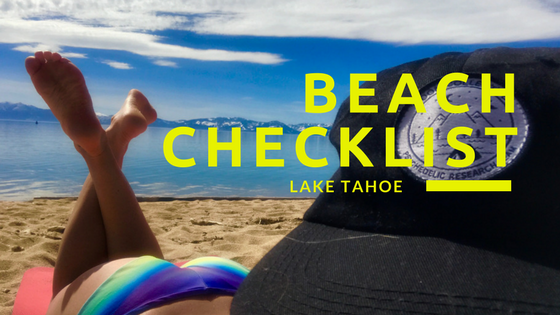 Come in to Tahoe Mountain Sports in Truckee and we can help you find the best beaches in Lake Tahoe! This Beach Checklist is the important stuff that you might forget so that you are comfortable and protected from the sun. It doesn’t include the fun stuff that you won’t forget like food, beer or other beverages including water so you don’t get dehydrated, sand toys, water toys and a beach blanket. 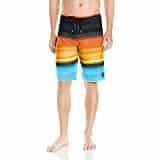 The number one item when going to the beach or planning a beach vacation is to remember to bring your swimsuit or boardshorts for guys. Trust me, you’re going to want to swim. We recommend a swimsuit that is comfortable, boardshorts that stay up, nothing with baggy butts or that falls down or rides up. You know what I’m talking about. 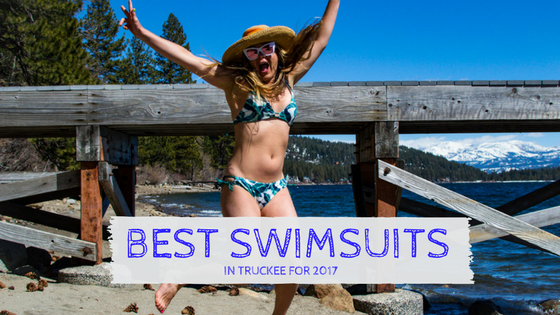 If you forgot your swimsuit or are looking to buy a new swimsuit we’ve got you covered with the Best Swimsuits in Truckee. For men and boys we have a great selection of O’Neill Boardshorts so stop by the store or click the link to shop online. What so special about O’Neill Boardshorts? We like them because they are made with some of the stretchiest and fastest drying fabrics available in unique styles and colors that hold up on long, active days at the beach. For girls we have an assortment of styles and patterns, one piece swimsuits and bikinis in sizes ranging from toddlers to teens. For me sunscreen is definitely at the top of the list. The sun is very strong in the mountains and you can burn in less than an hour and that will really put a damper on your trip. Have you seen the Ben Stiller movie where they go on their honeymoon, she gets sunburned and stays in the room for the rest of the trip? Don’t let that be you, bring lots of sunscreen to the beach and reapply especially if you have kids or are in the water a lot. We recommend Sol Sunscreen for many reasons. It goes on and spreads easily, it’s not greasy or sticky feeling when you wear it, and it works great – I know I won’t burn if I’m wearing it. It’s made with natural ingredients and doesn’t irritate sensitive skin. The Sol Sunguard Facestick also blocks the wind and prevents chaffing which helps protect your skin. Recently I tried Surface Sunscreen because I wanted a spray on sunscreen for my back if I’m alone. I absolutely love Surface Sunscreen Dry Touch Spray with SPF 50! It has a light, airy feeling when you spray it on, it’s not wet and runny like other sprays I’ve used. Then it magically dries instantly. And most importantly – it works great! I don’t have to use a ton and it works. These sunscreens are high quality and you only need to use a small amount to be effective. I use a dab of Sol Sunguard Bluewater on my face including ears and neck then spray my back, chest, arms and legs with Surface and I’m good to go! Chillin at the beach in Lake Tahoe! There are many options for shade tents, if you are coming to Lake Tahoe for a short visit a beach umbrella from Rite Aid will suffice. If you go to the beach a lot and are local I recommend buying the better umbrella from Costo at the beginning of summer or purchasing a more expensive sun shade tent like the Kelty Cabana. Another important beach essential is a good chair for hanging out in. 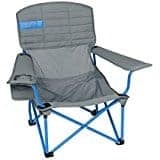 A sturdy chair is pretty essential for all summer fun activities like camping, music festivals and sporting events so invest in one that’s going to last and hold it’s shape. We recommend the Kelty Lowdown Mesh Chair because of it’s high quality materials, easy stowing ability and convenient carrying bag. It even comes in a double chair version – the Kelty Low Love Mesh Seat! The sun can be extremely draining especially at high altitude. One smart way to protect yourself from sun damage or heat stroke is by wearing a hat. We have a lot of great hats to choose from depending on your style. Outdoor Research makes some of the best hats for sun protection with wide brims, lightweight materials and sun reflective colors. We also have cool hats from the local brands BigTruck Hats and Annie P from Bishop, California. 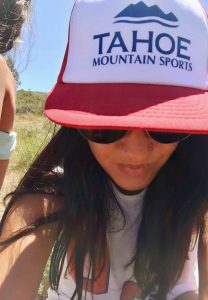 Check out these amazing Hats by Annie P featuring Eastern Sierra Peaks. We have these hats in stock now! Do you see the theme here? Sun protection is super important especially at altitude. It’s always a good idea to pack a long sleeve top in case the wind picks up and the temperature cools down or for when you’re cold after spending all day in the water. We have a great assortment of sun protective tops and O’Neill rash guards to choose from plus swimsuit coverups from Patagonia, Carve Designs and Prana plus a full assortment of UPF clothing for hiking and your active mountain lifestyle. One of my favorite things about summer is that I don’t have to wear shoes! I lived in Indonesia for 4 years and found that you can do pretty much anything in a pair of flips flops, at least I could when I was 25. We’ve got a great assortment of flip flops, sandals and water shoes from Reef, Olukai and Teva for adults and kids. Flips are great at the beach for two main reasons – the sand is really hot and may contain sharp hidden objects so they protect your feet and they’re much easier to put on compared to shoes when your feet are wet and sandy. Want to do some open water swimming in Lake Tahoe or Donner Lake? We have all of the accessories to make your lap swimming more enjoyable including 2XU Silicone Swim Caps, TYR Neoprene Swim Sleeves, TYR Swim Goggles and other assorted items and brands. We also rent wetsuits for open water swimming and triathlons. Coming for the Donner Lake Triathlon? 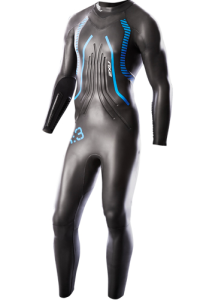 Rent a wetsuit and experience the advantage of using a 2XU Triathlon specific wetsuit! 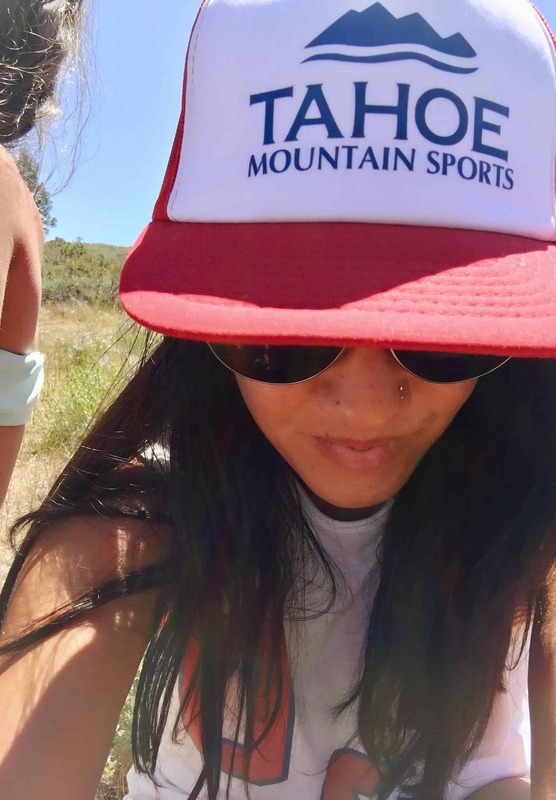 Stop into Tahoe Mountain Sports in Truckee for all of your Beach Essentials and we’ll help you find the Best Beaches in Lake Tahoe. Best Places to go Stand Up Paddle Boarding in Lake Tahoe. 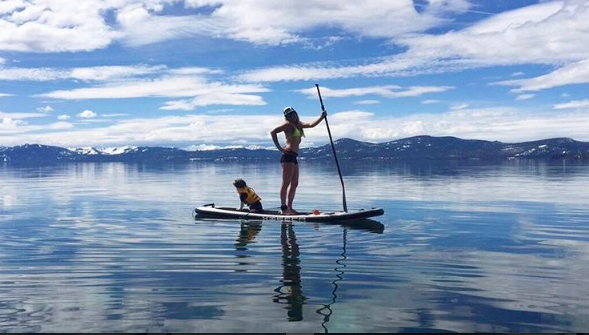 Click here to read about the best places to go Paddleboarding on Lake Tahoe.